The Pricing and Lien Holder Information screen displays the numbers entered into the Pricing screen when the deal was completed. The numbers on the left cannot be changed. If the deal was put through as "Outside Financing," information regarding the lien holder's monetary involvement will be listed. (Click on the picture to see how this looks.) 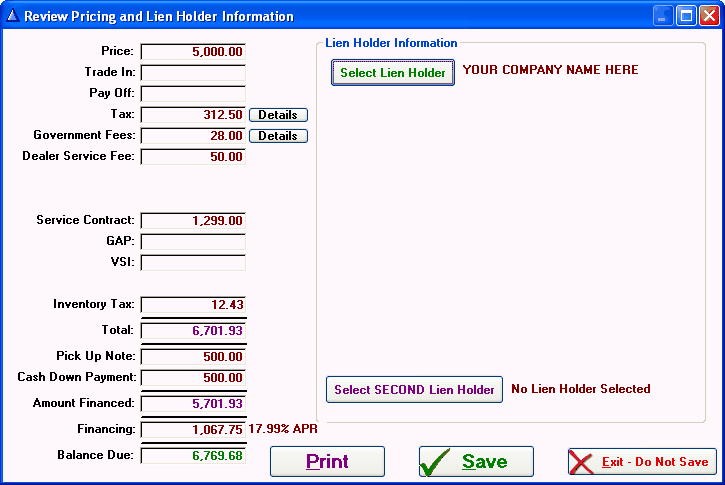 The amount on money expected from the lien holder may be adjusted from this screen. Clicking brings up the list of lien holders, allowing the lien holder on the deal to be changed.